Ideal for use with paint or ink pads, each foam stamp is 3" in diameter and mounted on a clear see-through top for easy, exact placement. Stamps also have a directional arrow for perfect alignment. Stamps and comfort-grip handles are color-coded for easy sorting and storage. Stampers are a great way to stamp out your own posters, wrapping paper and signs. Includes reusable, clear plastic storage case. Geometric Shapes. 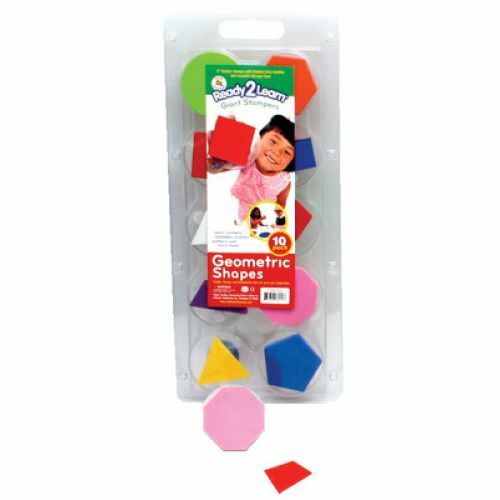 Includes hexagon, circle, rectangle, square, triangle, rhombus, octagon, trapezoid, pentagon, and kite.